Einstein@Home volunteers discover two new radio pulsars in Arecibo data! Einstein@Home has discovered two new radio pulsars in Arecibo "Mock" data! Congratulations to Dave and Emma Johnston of Jacksonville, Florida (USA) and to Piotr KamiÅ„ski of Warsaw (Poland) and to our other lucky volunteers! Further details about the newly-discovered pulsars can be found on this web page, and will be published in due course. Einstein@Home has discovered two new radio pulsars in Arecibo "Mock" data! Congratulations to Dave and Emma Johnston of Jacksonville, Florida (USA) and to Piotr KamiÅ„ski (Poland) and to our other lucky volunteers! Further details about the newly-discovered pulsars can be found on this web page, and will be published in due course. Jacksonville! Then they're at most an hour's drive away from me. We're getting awfully close to home, here. Our congratulations for Poland and Florida! I was wondering, is there a 2d or 3d map of the positions of our pulsars. So you can see the position and relative distance to the sun (not to close please). Or a data file to set them in Starry night or stellarium. This is excellent news. Congratulations on the discoveries! Einstein@Home has discovered two new radio pulsars in Arecibo "Mock" data! It is super to see such great results for the project. that's actually a nice idea! I like it! I can try to spend some time on this, shouldn't be too hard I guess. Ha ha, I know what you mean; but sticking to the science of the matter here, we are all equidistant. Congratulations to Dave, Emma and Piotr! Benjamin, I have a question. I'm new to E@H. I have excellent training in general relativity with the needed math skills but I need help with understanding the info on these pulsars. I'd very much like to get more involved. welcome to Einstein@Home, happy to have you on board! 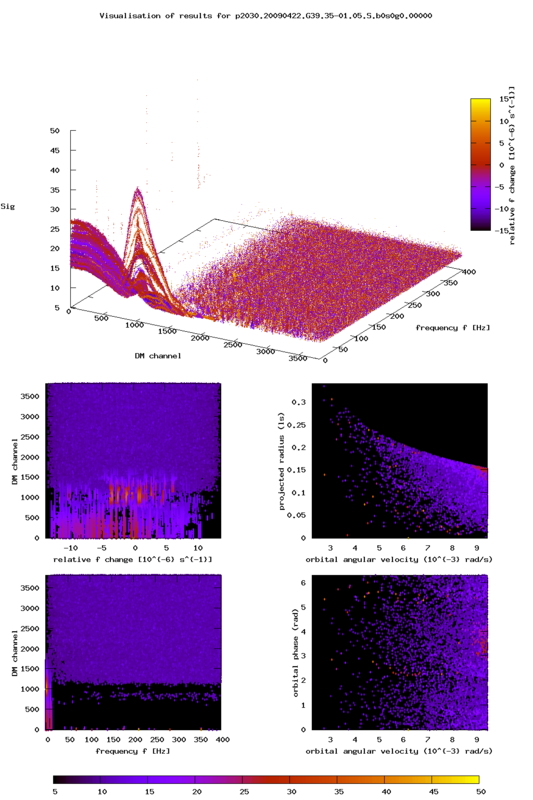 A gentle start with some background info on the radio pulsar search is available on our webpages in the section "Info on the Arecibo radio pulsar search". If you would like to understand in detail what the Einstein@Home result plots, e.g. this one, show you can have a look at my PhD thesis, which is available for download as a pdf here. Chapter 3 is a complete overview of the Einstein@Home radio pulsar processing pipeline. Section 3.10 details the post-processing and the overview plots you were referring to. If you have a general physics background this should be readable. If you would like more details on pulsars, you can read Chapter 2 of my thesis, better yet the excellent Handbook of Pulsar Astronomy by Michael Kramer and Dunc Lorimer, or "Pulsar Astronomy" by Lyne and Graham-Smith. prepfold is one of the standard tools of pulsar astronomy and is part of the much bigger presto software suite. When you've read up on pulsars most of the diagrams on the prepfold plots are almost self-explanatory, but I believe there's at least a tiny bit of information in my thesis (e.g. on page 151 below the prepfold plot for the discovery of J2007+2722). Hope that helps and thanks a lot for your interest! We're going to add ALL the Einstein@Home discoveries to the screensaver, perhaps with some form of mouse-over detail. The executables can/will function in two modes (i) as a screensaver that exits with any user input as you'd expect and (ii) as a standalone window in 'exploratory' mode accepting user keyboard/mouse input. The current Starsphere code already works this way, as will future examples based upon the existing framework for such. See here.